Zac Barton has released Bolt, a Unity Dash like menu extension for Gnome Shell. Zac Barton, the developer of Bolt, describes the launcher as ’a fusion of the Ubuntu dash, the Gnome-shell overview and the classic Gnome 2 menu which replaces the overview’. Much like the Dash it imitates Bolt is callable by the ‘Super’ key, is able to ‘match’ your desktop wallpaper color, track/search files using Zeitgeist, and gives ample screen estate to displaying your recently used files, folders and applications. 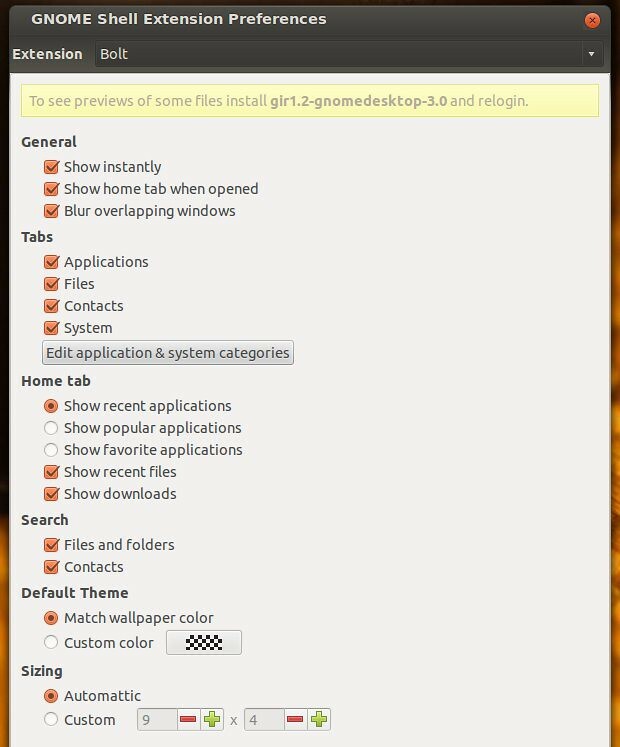 The extension replaces the ‘default’ GNOME activities overlay, but ensures that launching applications is just as easy. The extension has lots of options and you can configure it to suit your needs. No Comment to " Install Unity Dash in Gnome Shell Ubuntu or Mint "